The Founder’s Cup is The Storm King School’s highest honor and is awarded to a graduate who has demonstrated the following qualities: provided distinguished service to The Storm King School community; distinguished professional excellence; and/or regional, national, or global distinction. The Storm King School Alumni Association Awards Committee is seeking nominations this year for the Sports Hall of Fame 2019. 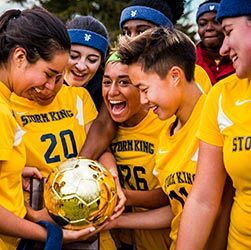 Nominations are being accepted for individual athletes, teams, and coaches whose distinguished records, dedication, and commitment to the ideals of The Storm King School Athletic Program exemplify the core values and mission of The Storm King School. Nominations for the SHF 2019 are welcomed and encouraged as soon as possible before the December 31, 2018, deadline. Please complete and submit separate forms for each nominee or team. An individual must have attended SKS for a minimum of two years, having left or graduated in good standing ten (10) years prior to being nominated. Coaches and Teams are eligible for nomination after a minimum of five (5) years since attending or working at Storm King School. Coaches and/or Athletic Directors must have coached a team or led the athletic program for a minimum of four (4) years, having contributed significantly to The Storm King School Athletic Program and the School. For a list of past recipients of The Sports Hall of Fame Award, please click here. All nominations are being accepted by the Storm King School Alumni Association Awards Committee. For questions or further information, contact Lynn Crevling ’72, Director of Alumni Relations and SKS Alumni Association Secretary at lcrevling@sks.org or 845-458-7517. Miss Margaret Clark retired from The Storm King School as a distinguished member of the faculty in 1938, completing 44 years of service as an art teacher. During her tenure, Margaret’s responsibilities grew from a teacher of art to head of the entire Lower School. During World War I, she ran the infirmary as well as the entire administration, while continuing to teach her legendary art classes. She is also credited with the designing of The Storm King School Crest that is used today. Established in 2006, The Margaret Clark Faculty Excellence Award is given during the School’s annual Reunion Weekend to a former faculty member of longevity whose dedication transcends the classroom and whose high ideals have become part of the student-centered tradition of The Storm King School.